Their closeness as brother and sister has led Danny and Katie Klee to share many emotional moments, but none has been like the one they experienced together in a prison on a recent summer night. The moment unfolded as the two young adults from St. Joan of Arc Parish in Indianapolis continued their efforts to share their faith and their friendship with young males serving time in the Pendleton Juvenile Correctional Facility. This maximum-security, Indiana prison has a goal of helping the inmates—ranging in age from 12 to 21—return to society “with the necessary skills to avoid further criminal behavior.” And on this evening, at the end of the weekly Bible study, the prison ministry volunteers and several young inmates huddled together, circling one of the youths who would be released from the facility soon. “We stretched out our hands over him, that he would make the right choices and look for guidance from God,” recalls Danny Klee, who is 32. The desire for freedom was evident on the face of the young man who would soon be released, just as it was for the youths who still had time to serve. But Katie Klee also was struck by another desire the youths had in that moment. “It was really emotional to see how badly they desire that sense of support and relationship with God,” says Katie, who is 28. “There’s the joy for them of knowing what they need to do to be successful when they get out, and there’s the fear that they won’t get the support they need when they get out. What strikes the Klee siblings even more is just how much their relationship with the youths has had an impact on them. It’s an unexpected connection that came from an unexpected result of prayer. 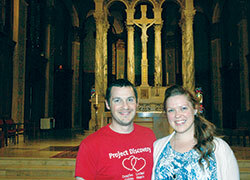 Besides their bond as brother and sister, Danny and Katie are both theology teachers. Danny teaches middle school students at Christ the King School in Indianapolis, while Katie teaches sophomores at Cathedral High School in Indianapolis. It’s an approach the siblings have for their own lives, so three years ago they started a chapter of the Community of Sant’Egidio at St. Joan of Arc Parish. A main part of the international prayer community’s focus is offering Christ’s friendship to people in need. The brother and sister just weren’t sure what would be the best way to do that, so they decided to pray about it separately. Katie’s prayers led her to want to try prison ministry—an involvement that neither had ever done. When she shared her choice with Danny, he told her he had made the same one. Their choice was reinforced by Providence through two other moments, Katie says. The first one came when she attended a meeting on how young adults can become involved in their parishes, and a speaker talked about prison ministry. Then she e-mailed Matt Faley, the archdiocese’s director of young adult and college campus ministry, for contact information to get started in prison ministry. 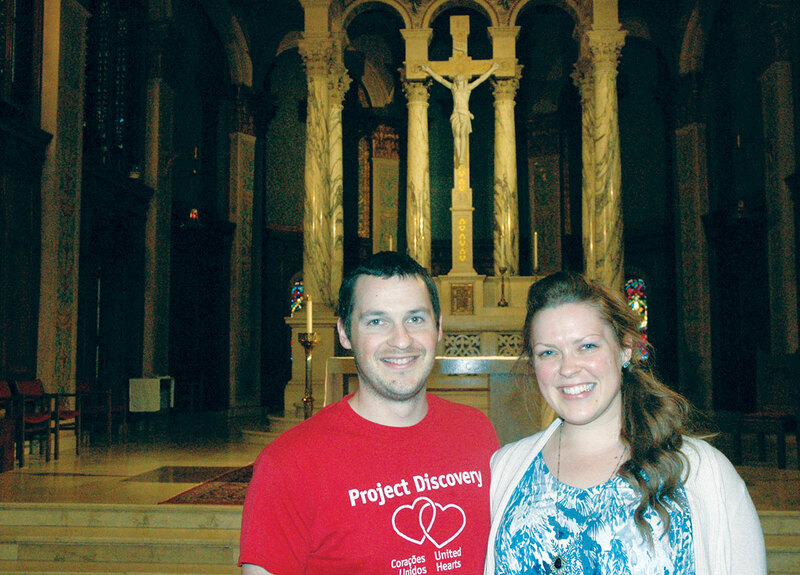 That’s how Danny and Katie became the youngest members of the archdiocesan task force—a group that met regularly for six months in 2016 to formulate a plan to help individuals, parishes and the broader archdiocese itself make an even deeper commitment to prison ministry. They considered it “humbling” to be part of a group in which some of the members had been doing prison ministry almost as long as the siblings had been alive. That question and concern led Danny and Katie to make their first visit to the Pendleton Juvenile Correctional Facility in 2016. They were led there by Ron Greulich, another member of the task force and a member of St. Simon the Apostle Parish in Indianapolis, who has been volunteering at the prison for 12 years. They were both apprehensive as they prepared to enter the prison for the first time. “I remember being scared, not knowing how they were going to react to us,” Katie notes. Their fears soon faded as the Bible study and the conversation flowed. Their visits have continued. So has the connection. It’s a connection that they’ve talked about with their students, a connection that is sometimes challenging for their students to completely embrace. Danny nods and says, “Growing up, we’re taught there are good people and bad people. The bad people are in prison. ‘Why would you go there?’ But to go there and see the goodness in them challenges what you’ve been taught. Katie says she uses such insights to try to “pull back the veil” from the lives of these young males in prison for her students. Sometimes, the youths in prison also make the brother and sister take a deeper look at themselves. That’s the grace the Klees have found through their experience in prison ministry.